The next Apple event is days away, with much of the tech journalists and bloggers frothing at the mouth over an anticipated new product launch. Will it be the oft-rumored Apple Tablet? We'll see. Just saw the Caprica pilot (I know, I know-it's been previewed before and released on DVD, but I didn't want to watch it until the season actually premiered) and I like it. Looks like it's gonna be an interesting season from the creators of the re-imagined Battlestar Galactica. Corporations Are No Longer Barred From Election Spending--So What & What Now? Supreme Court: Exxon and Wal-Mart Are People Too! Today the Supreme Court ruled 5-4 that corporations will no longer be banned from spending huge amounts of money on presidential or Congressional elections. The legal argument was basically about whether or not corporate-funded media designed to influence elections should be protected as free speech under the First Amendment. The decision was "Yes, it should." continue reading "Supreme Court: Exxon and Wal-Mart Are People Too! What Does Yesterday's Supreme Court Corporate Spending Decision Mean for the Environment? Following up on Andrew's post yesterday, I want to drill down on what impact this decision will have specifically on environmental issues and our hopes for passing a climate and energy bill this year. In short—it means bad things. continue reading "What Does Yesterday's Supreme Court Corporate Spending Decision Mean for the Environment?" I'm concerned about the recent Supreme Court decision allowing corporations to spend limitless amounts of money to affect the outcome of elections. I will stand with you as you identify and take bold steps to ensure that corporate special interests never drown out the voices of ordinary citizens in our democracy. So what if corporations can now spend money during elections? Consider this: corporations have big pockets, and even during the ban they were still able to use special interest lobbies to influence lawmaking. Now that the ban has been lifted, they can use all the resources at their disposal to get their candidate elected. Thought it was tough getting meaningful Health Care reform, Energy Reform or any number of regulatory, environmental or social packages passed today? Well brace yourself, because it's gonna get ugly-unless we do something now. Add your signature to Fair Elections, or call your representative. Spread the word or donate, every little bit helps. (1) viewers worldwide turn to particular broadcasters to affirm rather than inform their opinions, meaning the global news media are likely to reinforce existing attitudes and stereotypes of cultural ‘others’; and (2) the longer viewers have been watching Al-Jazeera English, the less dogmatic they are in their thinking and thus more open to considering alternative and clashing opinions. There are endless studies showing how slanted, infotainment news in the style of Fox doesn't do much to really inform people. But with The New York Times moving to a "metered model," it merits mentioning the further point that if we just let the market decide which media outlets survive we will likely end up with less informed, more dogmatic voters because people don't choose informing news. Disappointing, but not all that surprising. The above card skimmer, found on a Citibank ATM in Woodland Hills, CA, secretly scans your account information and PIN number, which it then wirelessly sends to a scammer. Would you have spotted it? Card skimmers have been around for a while now, but they're only getting more sophisticated and hard to detect. This one features a tiny pinhole camera that records victims' PIN as they punch it into the keypad, and it was clearly molded to fit and work with this exact ATM. Send an email to Adam Frucci, the author of this post, at adam@gizmodo.com. Scary stuff. Gotta stay vigilant if we want to stay safe. Password breaches happen on a pretty regular basis, but the one at Rockyou.com was massive -- involving 32 million users. Now that the dust has settled, security firm Imperva has taken the time to do a little analysis of the data involved. Verdict: it's 2010, and people are still using the stupidest passwords imaginable. Are you kidding me?! No...No, you're not. But this is a seriously sad commentary on two things. One: it shows that many providers of web apps and services still don't give a crap about helping make good decisions about security. They're perfectly happy to allow you to register with passwords that my grandmother could crack -- and she's never even touched a computer. Two: it shows that people don't care enough about their own security online to give more than a split second of thought when choosing the super-secret code which secures access to their accounts. Dictionary-based attacks would have succeed on the first attempt on more than a quarter million Rockyou.com users! Let's face it. These passwords are the digital equivalent of locking your front door by duct-taping the door to the frame. Is that how you want to protect your valuables, people? Download Squad readers don't need this PSA, of course -- but it's time to spread the word. Get your friends and family using tools like LastPass, KeePass, and 1Password. All of them make creating and remembering strong passwords a breeze -- and while that won't help if someone breaches a database like Rockyou's it's still an important step in staying safe online. The full report from Imperva is available as a PDF download if you'd like to read more analysis about the Rockyou breach. Protect yourself on the web! Start with a strong password and don't use the same password for all your accounts. As recently as early January, Brock Lesnar was convinced he needed surgery to deal with a case of diverticulitis – a condition that essentially left a hole in his intestine and put his career as Ultimate Fighting Championship heavyweight title holder in jeopardy. He might be out a year. Or it might be two. Or it might be forever. 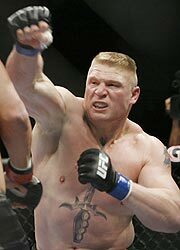 Instead, a series of doctor’s visits and tests have revealed what both Lesnar and UFC president Dana White described as a “miracle.” The big guy is healed and ready to return to the Octagon this summer, probably against the winner of the fight between Frank Mir and Shane Carwin in March. “Let’s be clear, I’m still the heavyweight champion,” Lesnar growled, in trademark fashion, on ESPN on Wednesday morning. Brock Lesnar is grateful for his supporters and focused on his return. There couldn’t be better news for the UFC and fans of mixed martial arts. Lesnar isn’t just apparently well again (although really, who knows if there could be a setback or another episode), but his return to fighting brings back the sports’ biggest box office star. Lesnar, 32, is a polarizing figure – or was until he got sick. You either loved his in-your-face ways or wanted someone to punch him in his face because of it. You were either one of the new fans that Lesnar drew in, perhaps from his days as a professional wrestler, or you resented them. Either way, Lesnar was difficult to shift your eyes away from. A huge man who needs to cut weight to make the 265-pound limit, he was growing as a fighter and an intimidator during his brief career. His fights were thrilling and he headlined the hugely successful UFC 100, which did a reported 1.6 million pay per view buys. His postfight tirade after his dominating victory over Mir at UFC 100, complete with flipping off the crowd and cussing out UFC sponsors, made him a tour de force. It didn’t mesh with his private life as a blue-collar, down home guy from South Dakota and Minnesota, yet Lesnar had learned how to sell fights during his days in the WWE. The truth was, he just wanted to hang out in the woods with his family and emerge a couple times a year to beat the heck out of someone. And now, it seems, he can again. Around the first week of April, kitchen tables nationwide are taken out of commission by piles of tax records. The clutter is more than a mealtime inconvenience -- it could be costing you some big bucks come tax time. According to the General Accounting Office, the average taxpayer overpays the IRS hundreds of dollars every year by overlooking deductions and missing chances to itemize -- opportunities that get buried in the forest of W-2s, 1099s, and quarterly and year-end statements each family generates throughout the year. Stop letting the dollars slip through your fingers and into Uncle Sam's pockets. Here's a streamlined, simple, easy-setup, quick-bake system to once and for all get it done and get organized for the IRS. Kick the "pile it and file it later" approach: It doesn't work. Trust us. The following three-folder system -- a basic organizational method -- is just as easy to manage year-round. Depending on the complexity of your taxes, you can add folders to best suit your needs. The Motley Fool’s Fiscal Fitness Boot Camp is in session! Every weekday this month, we’ll walk you through a fresh money-saving/money-making tip as we work toward finding $2,000 in savings you didn’t know you had. Do you like lending money to the IRS? The answer is yes for three-quarters of taxpayers. Every year, about 75% of us overpay our taxes. By quite a lot. In fact, the average tax refund last year was around $2,400, which amounts to $200 a month lining Uncle Sam's pockets until he pays it back to you ... without interest. If you hit the refund jackpot last April (or already know that you're getting a refund this year), then it's time to give yourself a raise, starting with your next paycheck. What's wrong with getting a refund? I know it's hard to beat the thrill of a windfall, but consider what you're passing up by giving Uncle Sam an interest-free loan for roughly six months (on average). If the IRS were paying out measly checking-account rates of around 0.5%, you'd be able to pick up the tab for a few espressos -- or $6. Even if you could earn 2% from a high-yield savings account , it'd amount to just $24. Nonplussed? I hear ya. For those who are tempted to skip this step and instead rely on over-withholding as an enforced savings plan, allow me to convince you otherwise. Think about where else you could get a better return than 0%. Perhaps you have outstanding credit card debt? Or maybe you have $0 in your emergency savings account. The point is, you could have $200 extra each month to pay off your debt (use our " Get Out of Debt " guide to wipe it out) or pad your emergency savings ( more on that here ). Let's get to the details so you can start seeing the fruits of today's Fiscal Fitness tip ASAP. The idea here is to increase the number of exemptions you take while avoiding underpaying. To nail the number, use the IRS' withholding calculator . The Form W-4 Assistant calculator at PaycheckCity can also help you. How much is each exemption worth? Well, generalizations and taxes are a potentially lethal cocktail, but if you thrive on rules-of-thumb, figure that each exemption equals about $850 in tax. One more note before you fill out a fresh W-4: This exercise is best for those who do not anticipate any major life/tax changes (e.g., marriage, birth, Lotto payout) and have a predictably consistent income. So if this year looks like it'll be a pretty close repeat of last year, go snag that $200 monthly raise right now. Don't fritter away the extra money: Just because your paycheck is a bit fatter doesn't mean you have extra money to spend. Nope -- this tip is all about putting the money you earned to better use. So if you're going to be tempted to blow the dough, have it diverted automatically to a separate savings or investment account. Out of sight, out of mind, and off to better use! Get organized and snag all those deductions/credits you deserve: Everyone gets a standard deduction, but that doesn't mean you should take it. Millions of people give up potential tax savings simply because they don't keep records or take the time to itemize their deductions. Especially for homeowners and those with high medical bills, missing out on itemized deductions is hazardous for your financial health. And if you do go with the standard deduction, don't just assume that you should take it on both your state and federal returns, or you could be leaving money on the table. Try this simple three-folder tax record-keeping system . What better time to put it in place than now, at the beginning of the year? Fiscal Fitness Boot Camp instructor Dayana Yochim has nothing against the IRS. She just doesn't want want to over-pay her fair share. I wonder, would this ever go from concept to production?